Learn to play the Didgeridoo, a musical instrument echoing traditions of the aboriginals, at a studio on the banks of river Ganga in the northern state of Uttarakhand. Sometimes the intersection of lives unites different cultures by passing on a legacy, and when a language as universal as music is shared, the bequeathed blossoms. River Ganga streams wide and divine psalms echo as you walk past the roads of Rishikesh, a sacred town in the state of Uttarakhand. Filled with shops selling handicrafts, bohemian clothes, vintage goods and books, its market route is fairly amusing and is surrounded by ashrams (hermitages), temples and holy ghats (riverside steps for devotional bathing). Amongst these, steady beats and strong rhythms spellbind the heart, heads dolling and fingers tapping in sync with the music, as you come across Jungle Vibes, a rustic studio store in Rishikesh that sells, crafts and teaches the drum, Djembe and the Didgeridoo, a wind instrument that originated nearly 1,500 years ago in Australia. As chronicled, the aboriginals of Australia developed the long, tapering instrument from hardwood especially hollowed eucalyptus or by cutting bamboo stems at the nodes. The smaller end of the pipe becomes the mouthpiece and the sound emanates from the broader end. Although a lot of mythical tales are concerned with its origin, the most commonly believed story is that of Dreamtime’s Yidaki. A mighty warrior, he was coming back home from a hunt when he picked up a dead eucalyptus branch lying on the forest floor, hollowed by termite ants. Yidaki gently blew through the log to rinse the termite colony and was taken by surprise at the peculiar sound the log produced. He took it back to the village and entertained his people, and the instrument slowly became a part of their culture, played, enjoyed and danced to on all merry occasions. As the myth goes, Yidaki’s soul transferred to the instrument after he died, and the warrior can still be heard playing the Didgeridoo if one listens carefully to its sound. As fate would have it, 37 years ago a traveller chanced upon an eager Indian youth, Mukesh Dhiman. Dhiman was working on a construction site in Rishikesh when he met Alistair Bullet, an Australian who asked him for assistance in crafting something. “I had no clue what it was all about, but I joined him and there forth, my adventure never ended,” Dhiman says. The first task had been to find a hollow log about 50 inches in length, “We went to a nearby forest and found one. It took us two weeks to make a Didgeridoo. During this time, he also taught me how to make the Djembe,” Dhiman recalls. Later, he made his first Didgeridoo by himself and a British tourist bought it. “After that, I never looked back and only made these two instruments,” says Dhiman. 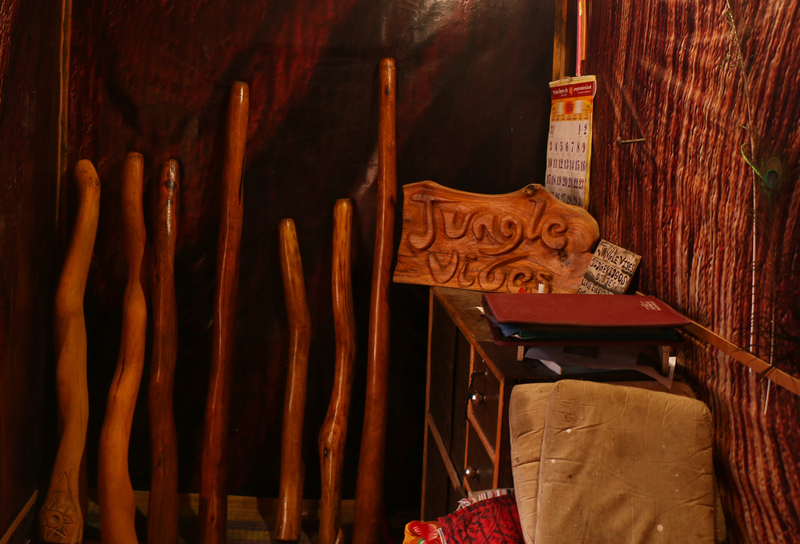 Clearly spotting a distinctive opportunity for business, he opened a store, naming it Jungle Vibes, in the heart of the town of Rishikesh, with the instruments priced at INR 3000 (around EUR 40) and above, proportional to the size and quality of the wood. Over the years, Dhiman mastered the craft of making the distinctive Djembe too, a drum originating from the Mandinka tribe, members of which are found mostly in Gambia and Guinea in West Africa. It is played by bare hands and is shaped like a goblet, covered with skin and tuned by a sturdy rope. The whimsical sound of a Didgeridoo relaxes the human mind, while the head wanders wild with Djembes’ rhythm. On the banks of pious Ganga, music is embedded as deep as the river you sit beside, wafting through the air, spawning positive thoughts and enhancing one’s aura.